This is a full day workshop consisting of two parts. Reconstruction of the auric field using the method of Korotkov - showing images before and after a massage with Manninder. Learn to SEE auras in one simple and exciting workshop. A very practical session where most people begin to see auras with their own eyes. This workshop is based on the famous aura workshops of Dr Tom Chalko, PhD. 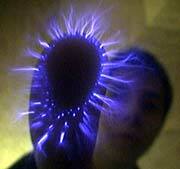 Use Kirlian technology to measure parts of the human auric field. All participants receive their unique bioelectrograms, as well as comprehensive instructions on how to interpret information about their health and personality.